It was a blessed day for us. The day before our flight, typhoon Feria was scheduled to hit Manila at 8 in the evening. However, several hours prior to that, when the typhoon reached the Mindoro area, its intensity weakened and its arrival to Manila was delayed. At the morning of our flight, rain began to pour heavily and the sky was instantly filled with clouds. It was with tremendous prayers and positive thoughts that our flight finally pushed through after a two hour delay. My mantra, which I adapted from another adventurous friend, was “Sunshine and blue skies”. My other companion, Connie on the other hand was referring to typhoon Feria as “friend Feria” and she talked to the typhoon as if it was a close friend, in her head asking Feria to let our plane through. As we began our descent to Basco airport, we were greeted with views of the unbelievably beautiful rolling hills of Batanes that we could not help but shriek in awe despite the fact that the plane was shaking violently. It was a rough landing as the plane kissed the tarmac. To our amazement, when we got out of the plane – it was all sunshine and blue skies! 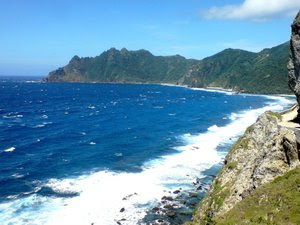 In fact, it felt like summer even if it was past the summer months of Batanes. The beautiful Mt. Iraya which loomed at the end of the runway was our welcome party. Instantly, I began clicking away despite the fact that I am not that into photography. We rode a trike towards the National road (which looks a lot like an ordinary street) where we scouted for inns. We tried at Shanedel’s Inn but the rates were higher than what we were willing to spend. Actually, it’s quite reasonable, but we needed something cheaper – like 250 pesos per head. Shanedel’s Inn’s room were ranging from 900 to 1200 per room . We walked to its neighbor inn – Ivantan Lodge which had the rates we wanted. Unfortunately, they were fully booked. We learned from the lady in the reception that VP Noli De Castro will be in Batanes the following day for the festivities and that his advance party had occupied most of the rooms. We learned that incidentally, we came two days before the weeklong fiesta ended for Batanes Day so the whole province was celebrating. Cool. We weren’t worried then about where we would be spending the night. Our major concern were our nagging stomachs. From the National Road, we headed towards Abad Street, another major road in Batanes and this is where we found Carl’s eatery. We read from a blog that this is where Creamline ice cream are sold. After a hearty lunch – meal rates here are higher by the way – around 60-120 pesos per meal but the serving of rice is huge. We then proceeded into loitering aimlessly around town, just taking in the views. We ended at the Basco port near the Coastguard station and took some more pictures. We headed to the town plaza and saw a trade fair which showcased different products of Batanes per town. After roaming the fair, we searched for a jeep bound for the municipality of Ivana to check out Honesty Café and the house of Dakay. At this point, we still had no idea where we were going to end up for the night. We spotted a jeep near the town plaza and got the seats beside the driver. We were told that the fare is only 25 pesos. The ride took about 45 minutes, with the driver taking his sweet time cruising down the road. It turned out to be a great thing because the landscape in Basco takes your breath away. It was so surreal. Me and Connie probably looked like fools to the people we were riding with because we were oohhing and ahhing at every wonderful sight. The way we were acting made us seemed as though we had just emerged from a dark hole. From the House of Dakay, we walked for about 10-15 minutes towards the Radiwan Port which has beautiful cement structures by the beach. A few steps from that, was the famous unmanned Honesty Café where one leaves their payment inside a drop box. We were fortunate enough to meet the strong-willed owner – Mrs. Elena Gabilo, as well as her sister who lives near the café. We learned from them that there are no accommodations in Ivana. The San Vicente port where we were to take a faluwa ride to Sabtang Island was in Ivana and we didn’t want to travel back to Basco. We decided to just roam around until we find some people to stay with. Besides, the last jeepney ride to Basco had already left. It was nearing 7:00PM. The sun was still up and while walking in the almost deserted street, an old lady comes up to us and asked where we were headed. We informed her that we needed a place to stay and she volunteered her place. f we were back in the city, we would have declined. But this is Batanes, home of honest Ivatans, so we decided to take a chance. We followed her through several streets and ended in a place where we could hear the ocean. She led us to their family compound – a whole row of houses belonging to their clan. 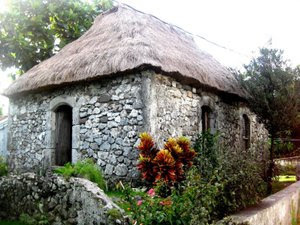 Like the rest of the houses in Ivana, it was made of rocks. Instantly, we felt at ease as we chatted with their family and after taking a much needed bath, we lay on the floor beside her grand children. That evening, we slept soundly, even snoring oh so muscularly. We woke up the following morning at 5am to catch the trip to Sabtang which was supposedly at 6am. We gave her something for consuming their water and to thank them for their generosity. From the municipality of Ivana where we spent the night, we walked for 15 minutes to the port of San Vicente. The boat left at 6:30am and the ride lasted for about 45 minutes. The waters of the Pacific Ocean and South China sea were a little rough but manageable. From the Sabtang port, we met 6 of the members of the Camera Club of the Philippines (CCP) who were there for a photo shoot. They were an adventurous , friendly bunch. Since we came there with no prior arrangments, we agreed to share a jeep with them so we can split the cost. Jeepney rental was at 1,500 pesos and the amiable driver took us to the following destinations:1. Saviduk - a municipality filled with stone houses2. 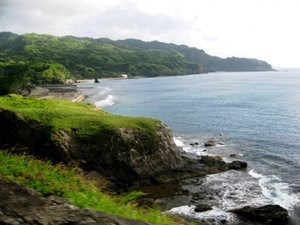 Sitio Tinyan – offers unbelievable views of the Pacific ocean3. Chavayan – another community of stone houses with beautiful mountain ranges serving as its back draft. This was also where the most recent Nescafe commercial was shot4. Nabuang Arch in Malakdang – where a beautiful rock formation is found along an amazing beach front. This was also where I got my sunburn. Me and Connie couldn't resist the waters of the Pacific Ocean. The water felt so light on the skin - it felt like we were taking a deep in a river, only the water was quite salty. We had lunch at this eatery beside the port. I think the name was CBNK. For 250 pesos per person, we had lobsters, pinakbet, banana fritters and a heaping portion of turmeric rice. At the port, a passenger jeep was waiting to take us back to Basco.We set off on another boat ride back to Ivana at 2:30PM. 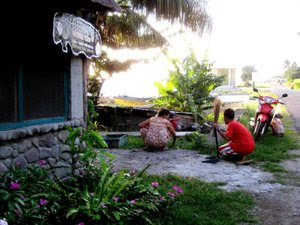 When we reached Basco, we decided to try the Ivatan lodge to see if we could get a room. Unfortunately, the advance party of VP Noli De Castro hasn’t left due to aircraft troubles. So off we went again around the streets of Basco to search for our 250 peso- room accommodation. While walking near the market, we ran into the lady we met on the boat back to Ivana. We told her we needed a cheap place to stay and she suggested a relative’s place. She accompanied us to their house, a huge stone house at the corner of Argonza and Amboy street. They were renting out a room with a huge window and a smalll television with cable transmission. We agreed to the arrangement immediately. The huge double-sized bed costs 250 per person. 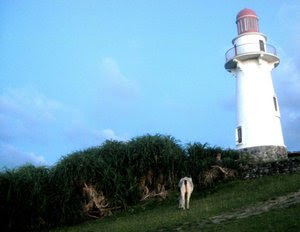 After 5pm, we set off for the famous Basco lighthouse located on top of the Naidi Hills which is overlooking the Pacific Ocean and the South China sea. From were we stayed, the hike going there took an hour. We just asked around where it was and people were very helpful. We again ran into the friendly gang from the Camera Club of the Philippines who were doing landscape shots. This place is ideal for meditation, heart to heart talks or just sight-seeing. After the hike, we ate at Casa Napoli for the second time that day. It serves great-tasting thin-crust pizza and is open daily from 5:00PM-9:00PM. On our third and final day in Batanes, we walked around the area near the airport after checking in. Good thing we went in early as there are no electronic scanners in Basco so the process of scanning your luggage was cumbersome. The airport personnel inspected our bags by hand. From the airport, we walked to the Pension Ivatan which is three minutes away and within its vicinity is Therese Coffee Shop famous for its bulalo. We also ate brunch at the eatery fronting the airport entrance. The rates for souveneir items in Batanes is standard. It seemed that they sell each item at the same price any where you go. Magnets are sold for 3 for 100 pesos or 35 pesos/piece; Key chains – 3 for 100 or 35 pesos/piece; souveneir shirts are normally sold at 200pesos and above. I read about a certain airline called Pacific Air which flies to Basco from Laoag. Just double-check in the net, as I’m not sure if it still exists. If you take out the airfare, that means I only spent 2,608 pesos as pocket money for this trip. 5178 *Note : As of this writing, there are no more Zest Air flights to Basco. If you are coming from Manila, you need to book via Sea Air.